David Reisman/Real Estate Millions The Sun West showcase home in MacDonald Highlands includes a basement water feature that helps cool the home. 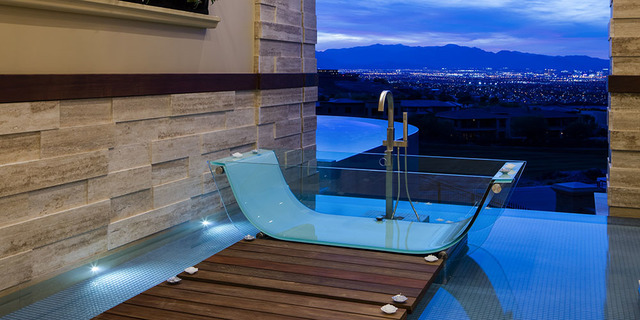 Courtesy Sun West Custom Homes Sun West Custom Homes' showcase home features a master bath that can be open to the pool area and the Las Vegas skyline. As a second-generation homebuilder, Dan Coletti has spent a lifetime honing his abilities and vision of what the ultimate estate home should look like, as well as the comforts it should provide its owners. 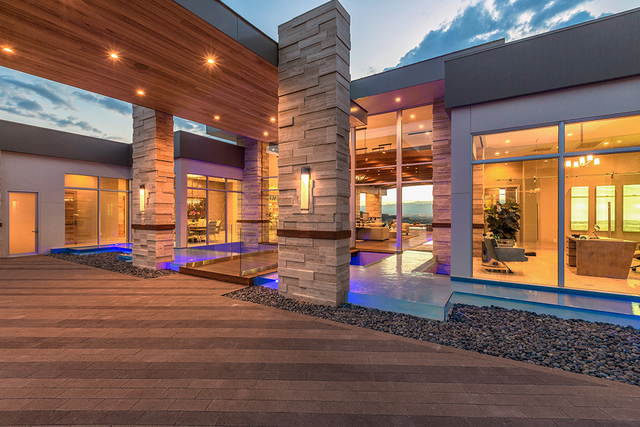 Coletti knows luxury homes: Of the 25 most-expensive homes in Southern Nevada, Coletti and his company, Sun West Custom Homes, have built most of them. Waters Edge at MacDonald Highlands is the ultimate expression of everything Coletti has learned. 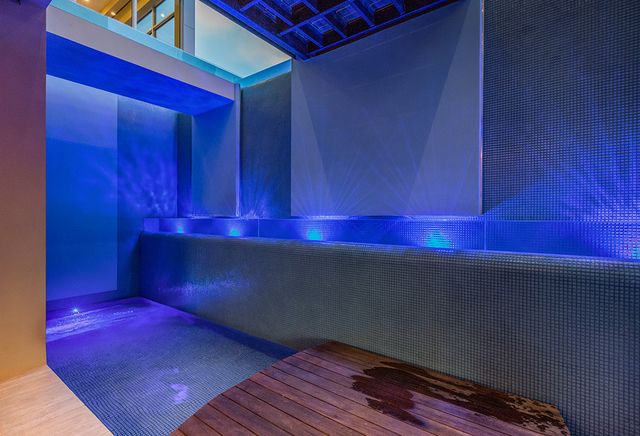 Coletti is naturally drawn to water and the tranquility that it can bring. Fire can also be used as an accent that draws the eye and can have a hypnotic, relaxing effect. It’s been called nature’s television. 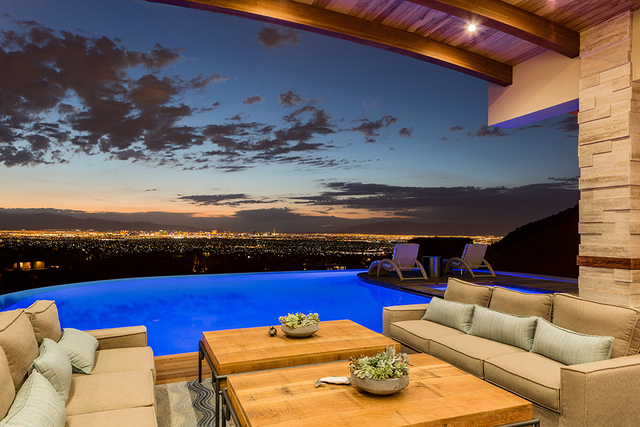 Coletti uses the elements to frame the view of the Strip with the lower third of the view established with a deep blue infinity pool with outdoor fireplaces situated between the pool and an outdoor lounge. Visitors to the home are greeted by streams of water cascading down on either side of the home’s entrance while serene water features run through the home to the pool beyond. No detail is overlooked. The staircase wraps around a ceiling-to-basement wine rack. If the handrail feels comforting, it’s because it is hand-wrapped in a leather. The downstairs portion of the home is cool and comforting as a waterfall cascades to a pond just a few steps from the bar and sunken conversation pit. Incredibly, there is also a view of the pool from the basement — this one from inside the pool. During social events, Coletti’s guests are sometimes awestruck when they see the in-house mermaid swim by. There is generous use of photovoltaic solar panels on the roof that not only capture energy but also further insulate the roof. “We built the home for visitors who are considering the design and construction of an estate home, and we invite you to view Waters Edge for yourself,” Coletti said. Waters Edge at MacDonald Highlands won four awards in the 2017 Silver Nugget Awards including Home of the Year. The show home is in MacDonald Highlands at Valle Verde Drive and Horizon Ridge Parkway in Henderson. The home is open daily 11 a.m. to 5 p.m. Closed on Mondays. Call the sales office at 702-616-3030. For more information, visit www.sunwestcustomhomes.com.